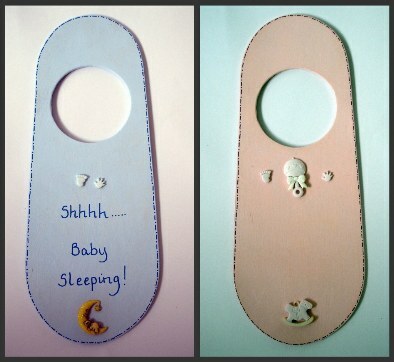 This blue or pink painted wooden door hanger measures about 24 cm long and 8cm wide. On the front is the wording 'shhhh baby sleeping' or your own choice of wording. The reverse side can either be left blank or your own choice of wording again. Baby themed embellishments are added to the front, and reverse if wording is chosen for the reverse.